Shroud University - Exploring the Mystery Since 33 A.D.
Also known as the ventral image. It is usually viewed horizontally during an exhibition but the image has been positioned vertically for better viewing. Large burns and scorch marks from the fire in 1532 seem to frame the image. Look for the blood on the arms, nail wounds in the wrist, wound in the side and blood on the head in the hair. Also notice water stains from when the cloth was rolled up and kept in some kind of urn. The water stain over the knees shows that the image is not water soluble. The edges of the water stains are due to calcium deposits. Also known as the dorsal image. Notice the apparent crown of thorns and scourge marks that criss cross the back and legs. About 120 such marks can be counted. Notice the blood across the small of the back that flowed from the side wound after the body was laid out horizontally after death. At the bottom are the feet, one foot placed upon the other and nailed into position. Notice the nail wounds and corresponding blood flow. 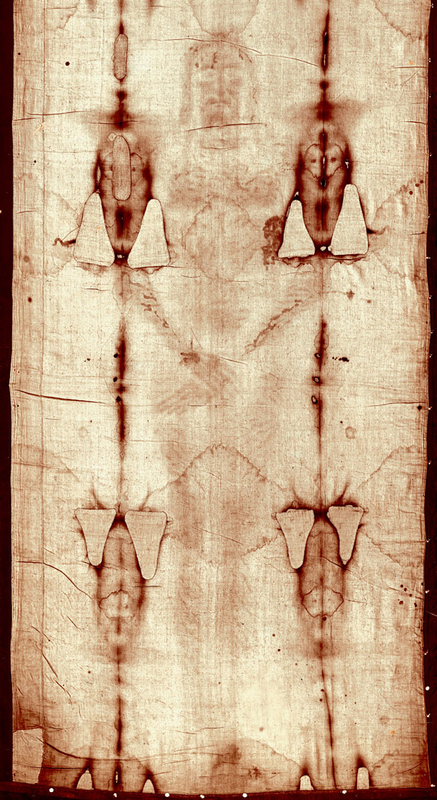 An historic restoration work was carried out on the Shroud from June 20 to July 22, 2002 by The Commission for the Conservation of the Shroud in Turin, Italy. Why was it done? Cardinal Severino Poletto, archbishop of Turin, explained that the purpose of the work was to guarantee the conservation of the cloth. The most pressing need, although some experts do not agree, is that the charred areas of the cloth from the fire in 1532 were causing carbon particles to spread over the shroud, which may be damaging. The biggest threat has always been exposure to light, which is why it is so seldom brought out for public viewing. What did they do? Thirty triangular patches, sewn by nuns of Chambery, France, in 1534, after a fire damaged the relic in 1532, were removed from the shroud. Also removed was the "Holland cloth" sewn on the reverse of the shroud 450 years ago to preserve it. They also removed dust and debris that had accumulated on the cloth over the centuries. All the material removed has been catalogued and placed in safekeeping. It is hoped that this material will one day be made available for future research. Why controversial? The restoration was done in secret with minimal scientific peer review as to whether their proposed cleaning and repairs would cause more harm than good. Some scientists felt it was unnecessary. Others felt that the cloth should be treated as an archaeological site and be left intact with all resident debris. Why in secret? The Commission claims it was due to the fear of terrorism. Other experts believe it was because they did not want international intrusion.. The only non-Italian participant was Swiss textile expert, Mechtild Flury-Lemberg, former director of the Abegg Museum in Berne. More harm than good? 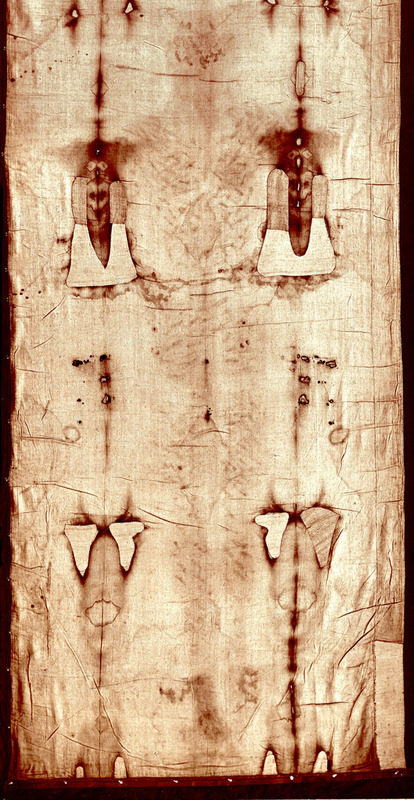 Some experts believe that important data has been removed, data that could have yielded important clues as to the Shroud’s long but patchy history. Only time will tell if the restoration hinders or enhances future research.